U-Reach Data Solutions Inc.: Going for Gold? No, we’re not talking about the Olympic medals; instead, it’s about two flavors of U-Reach’s Intelligent 9 flash duplicators: Silver and Gold Series. We’d like to take this opportunity to explain what differentiates the Gold and the Silver. For details about Intelligent 9 duplicators for media such as CF, SD/microSD, and USB etc., please visit ureach-usa.com. With a price tag of 25% higher than the Silver (or base) model, the Gold Series has certainly come with more bells and whistles. Burn-in testing is one of the major enhancements. For factories or businesses that are meticulous in the quality of their flash memory cards/drives, this utility helps them pick out the bad apples by continuously writing and verifying data for a desired number of cycles or specified duration (30 min to 30 days). With models available from 10 to 120 ports, the Gold Series performs burn-in on all ports simultaneously. Another addition is the logging capability. For users who need detailed job reports for auditing or trouble-shooting purposes, the Gold Series can store up to 30,000 records and dump them all in a card/drive. A typical record starts with a sequence number and timestamp, followed by port ID, status and task performed. In the event a job fails as a result of a bad sector on the media, the location of this sector will also be logged. Password protection of the log file can also be turned on if necessary. An additional benefit of logging is to retrieve information that can be tough to gather otherwise. 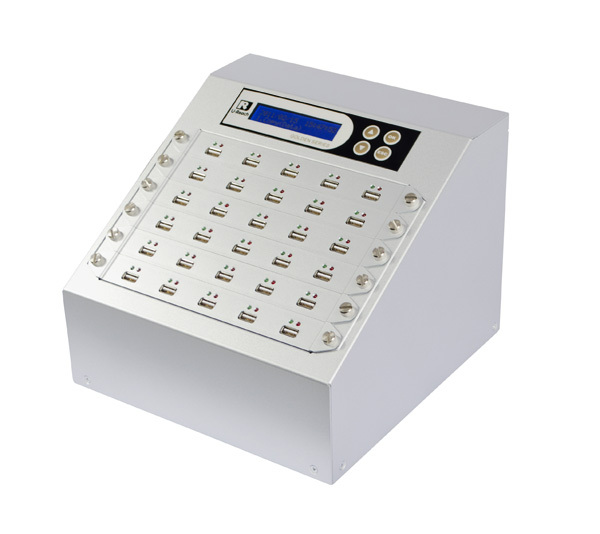 Take SD930G for example, this Gold Series 30-slot SD/microSD duplicator logs the card IDs (CIDs) of all the SD cards inserted within seconds, which is very beneficial to those who need such information for serialization. In the games of duplication, Gold doesn’t always beat Silver though it does fit the bill for those who need it the most.